Bookmarking. It’s something I’ve always struggled to find a good solution to. The in-browser features don’t really make it easy to quickly find common URLs, and I’ve tried to use other websites in the past, but they just didn’t seem to stick in my mind. The closest I’ve come to finding an answer is in Alfred, which I’ve blogged about before. 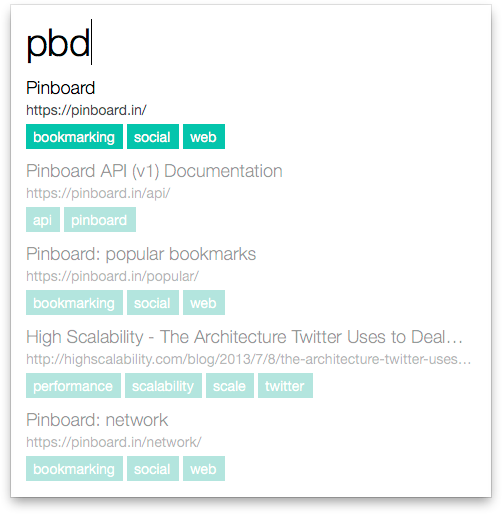 There are a few different ways you can bookmark with Alfred, but I didn’t quite find that any of them matched what I was looking for. First, I tried using the ‘web search’ feature to associate bookmarks with particular keywords. The problem with doing this though, is that you need to remember the exact keyword to call up the site you want. As as a result, it isn’t all that great for keeping track of lots of different locations. Another solution was to use the Alfred Snippet Manager. This could be a really good solution, as you would be able to search by the title and description that you enter, as well as the content of the actual URL itself. However, if you already use the Snippet Manager for predefined replies – more like a clipboard manager – then having a large number of bookmarks in there could pollute the results, increasing the time it takes to find the things you need effectively. I set out to find an alternative, and made use of my old Delicious account to create a workflow that could search through my bookmarks by making use of the private RSS feed. It worked, but was a bit clunky, and not as intuitive as I’d have liked. That meant that I didn’t ever really make use of it. I stumbled upon Shiori completely by chance, and was surprised I hadn’t seen it mentioned anywhere before. Both the website and the app itself are beautifully simple, and easy to use. You simply set it up to connect to a Delicious (free), Pinboard ($11 annually) account, or both. Personally, I use the latter – as Delicious keeps making changes to their service which break things. The $11 is worth the money. Call up the interface with a hotkey, and you can search through all of your bookmarks in an interface that is awfully similar in feel and operation to Alfred. The similarity isn’t a criticism, as Alfred is amazing. You can search via tag, words, or even abbreviation. Like Alfred, the more you use the app, the smarter it gets – picking up on the type of searches you use most commonly to find particular bookmarks. Because it uses your login details (and doesn’t just pull it from the RSS like my hacky method above), it’s really fast too. There’s also a hotkey that can be set to bookmark new websites quickly from the browser. If you have Keyboard Maestro installed, Joseph Schmitt has created a pretty sweet workflow which you can assign to an additional hotkey. It takes the highlighted text and automatically adds it into the ‘notes’ field. More on Keyboard Maestro in a later post. This type of bookmarking is often called ‘social bookmarking’, as they are largely designed to be public, to share with friends etc. 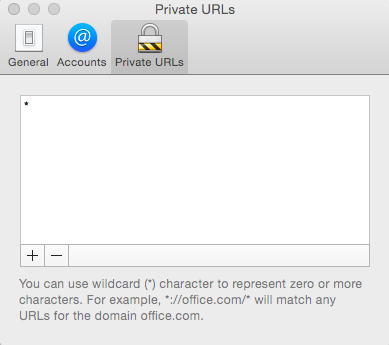 I’m not really into that, and prefer to keep my URLs private. Shiori makes it easy to automatically tag new bookmarks as private, to avoid having to do it manually yourself every time. You can add in certain domains (if you want to keep particular – ahem – websites – private), but if you stick in an asterix, it will capture them all. In summary, I love Shiori. The design is as nice as Alfred (and it works just as well), it arguably works better for bookmarks, and it helps keep things compartmentalised. Snippets are now assigned to one hotkey, Alfred another, and Bookmarks another. You can download Shiori for free (yes, completely free) here.